You are viewing the 12' Round Trampoline Mat Replacement with 60 5.5" Rings. 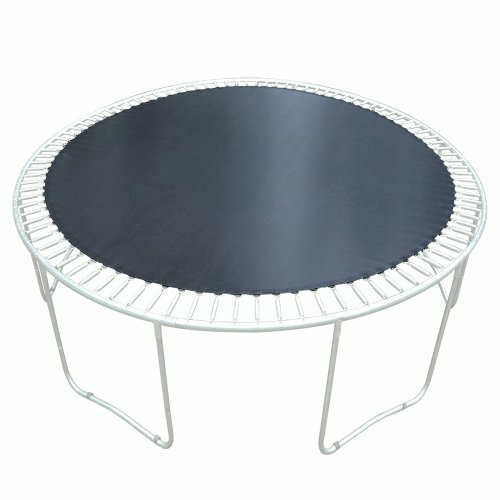 This premium jumping mat is designed to fit your 12ft-framed round trampoline with_5.5" spring_and 60 spring holes. Made with heavy-duty polypropylene, the mat is treated to be waterproof, UV-resistant, scratch free and more durable. The 8 stitch lines and galvanized V-rings, features extremely strong tensile strength and guarantees the mat from tearing. 1. Trampoline Frame Size - Measure outer diameter of the frame in at least 2 different places when it is fully assembled. 2. Mat Size - Check your old mat diameter of the edge fabric excluding the V-rings when it is fully extended. 3. V-ring Quantity - Count the ring quantity on your current mat or spring holes on the frame. 4. Spring Size - Make sure the distance of hooks from tip to tip fits. If you have any questions about this product by Generic Brand, contact us by completing and submitting the form below. If you are looking for a specif part number, please include it with your message.